All the major stats and numbers that were recorded during the opening day of the Abu Dhabi Test. Pakistan holds the key in the second match of the two-match Test series in Abu Dhabi after as many as 12 wickets fell on the first day’s play. Nathan Lyon ran through Pakistan’s top-order by taking four wickets in the space of six deliveries as they went down from being 57/1 to 57/5. Later, the debutant Fakhar Zaman and skipper Sarfraz Ahmed rescued the team with a 147-run sixth wicket partnership. Both the batsmen got out on 94 but Pakistan managed to finish on 282. Australia ended the day at 20/2 and lost their last match hero Usman Khawaja. 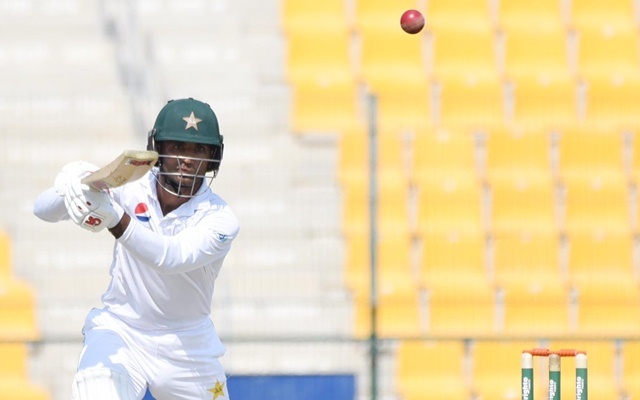 1 – Fakhar Zaman and Sarfraz Ahmed are the first pair to share a 100-run partnership in Test cricket after the team lost four wickets at the same score. The previous highest partnership coming in after team losing four wickets at the same score was 85 by PS Masvaure and DT Tiripano of Zimbabwe for 9th wicket after they went down from 72/4 to 72/8 in the 2016 Bulawayo Test against New Zealand. Pakistan’s innings was also the first instance of a team losing four wickets on the same score between two fifty-plus stands in Test cricket. Fakhar and Azhar Ali shared 52 runs for the second wicket before the collapse. 2 – Nathan Lyon became only the 2nd Australian to claim four wickets in the space of six deliveries in Test cricket. Jason Gillespie recorded this instance in England’s second innings during the 1998 Perth Test match. 3 – Marnus Labuschagne became only the 3rd Australian and overall the 12th bowler to dismiss two batsmen in the 90s in a Test inning. Only Victor Trumper in the 1902 Johannesburg Test against South Africa and Bruce Yardley in the 1981 MCG Test against Pakistan have achieved this feat for Australia before Marnus. 4 – Fakhar Zaman and Sarfraz Ahmed getting out on 94 is only the 4th instance of two batsmen getting out on an identical score in the 90s in a Test inning. India’s VVS Laxman and Irfan Pathan got out on 90 in the 2006 Faisalabad Test Pakistan, Australia’s Mark Taylor and Ricky Ponting made 96 apiece in the 1995 Perth Test against Sri Lanka while Majid Khan and Mushtaq Mohammad of Pakistan got out on 99 against England in the 1973 Karachi Test. 6 – Babar Azam now has six ducks in his Test career. Since Babar’s Test debut in October 2016, no specialist batsman has bagged as many ducks in this format. Only Stuart Broad (9), Shannon Gabriel (8), Nathan Lyon (8) and Nuwan Pradeep (7) have bagged more Test ducks than Babar in these two years. 7 – Pakistan’s first innings is only the 7th in Test history where No.4, No.5 and No.6 were dismissed for a duck. The last such instance was recorded during Bangladesh’s first innings in the Antigua Test against the Windies earlier this year. Pakistan became the first team to be on the batting side twice in this list as their No.4, No.5 and No.6 bagged ducks in the opening innings of the Napier Test against New Zealand in 2009. 10 – Mohammad Abbas completed 50 wickets in Test cricket in only ten matches. He is the joint second quickest to achieve this milestone among Pakistan players after Yasir Shah (9). 94 – Fakhar Zaman became only the 4th Pakistan player and overall the 31st to be dismissed in the 90s on Test debut. Abdul Kadir (95 in 1964), Taslim Arif (90 in 1980) and Asim Kamal (99 in 2003) were the other three players from Pakistan who missed their tons on debut. 314 – Nathan Lyon became the 4th highest leading wicket-taker for Australia in Test cricket. Lyon surpassed Mitchell Johnson (313) and Brett Lee (310) with his four-wicket haul.